I absolutely love a good taco. Chicken, fish, you name it, I love it. Taco’s are great because you can make so many different variations. 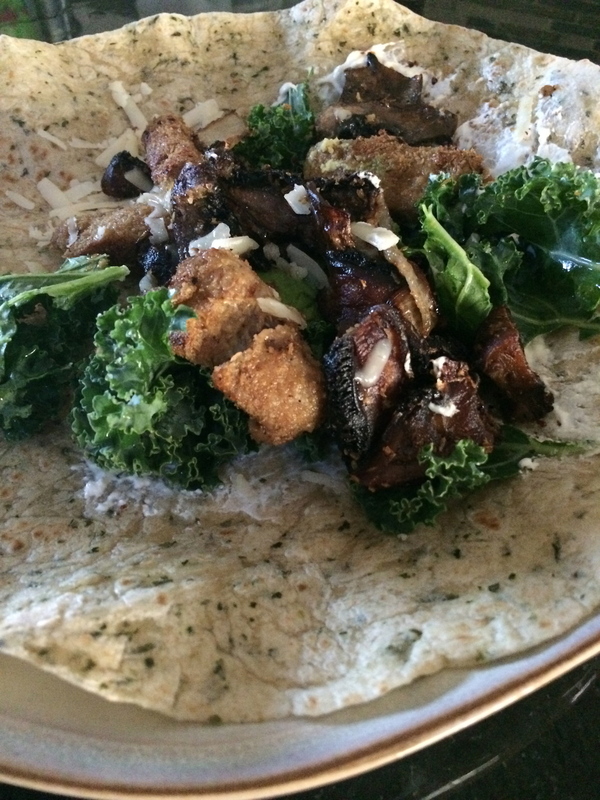 Now, these tacos, my boyfriend pointed out, are more of a wrap than a taco because the large wraps were all I had but, you could totally use smaller wraps and make them more like a taco. The principle is the same. 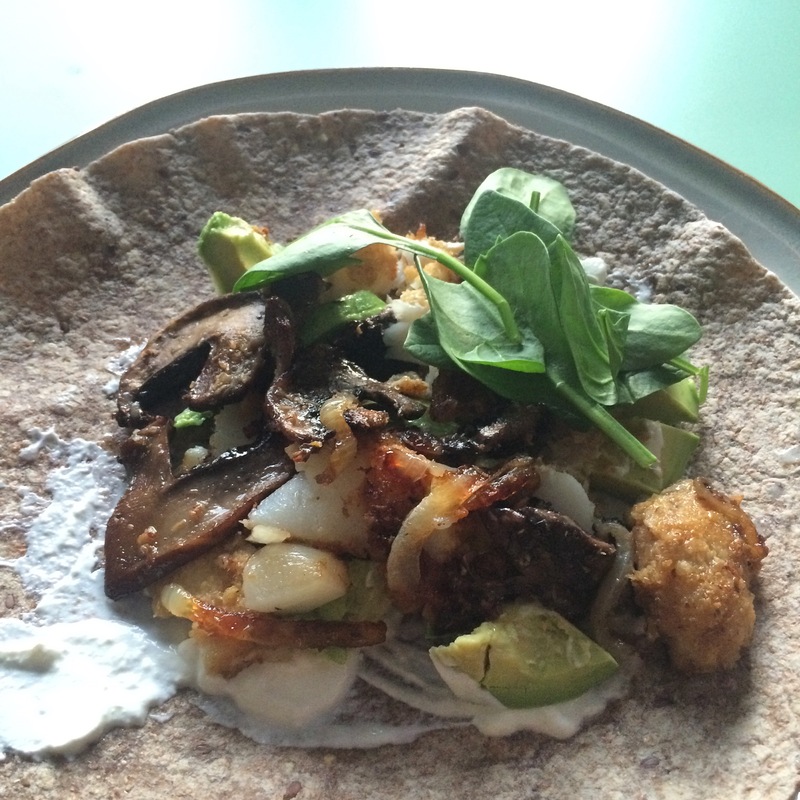 I’ve made virtually the same taco, two consisting of only veggies and one that had cod. 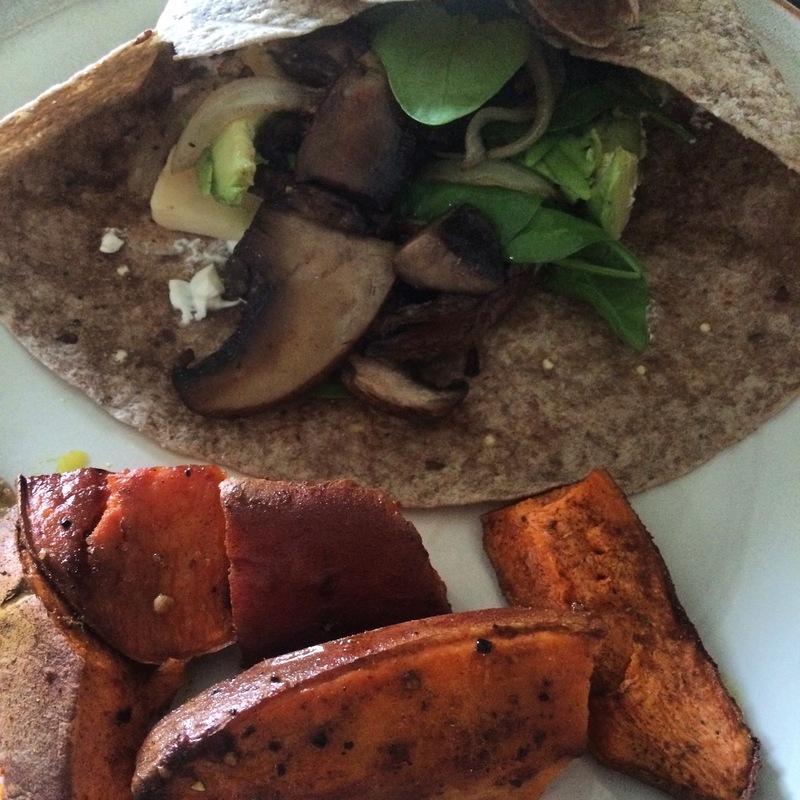 One taco had just portobello mushrooms fried with onions and garlic, seasoned with salt and pepper and in the taco or wrap part I added half of an avocado, spinach or kale, spread some creme fresh, and added some sharp cheddar cheese. You could vary this to suit your dietary preferences of course, and that’s what I love about tacos — you can take simple ingredients and then adjust them slightly based on your dietary needs and voila, a tasty masterpiece. I’ve been craving mushrooms lately, but, these are really good with “breaded” cod or “breaded” seitan. You will need three dishes, one consisting of milk (I will note modifications for this,) one consisting of flour, and one of breadcrumbs or corn meal. Next, cut the seitan or cod into strips, whatever size you see fit. Dip the cod or seitan into the flower, then milk, then the corn meal. Fry with the mushrooms and onions for a few minutes, until golden brown or until the fish is cooked. *To note, instead of using milk or flour for the breading, I have dipped the pieces in apple cider vinegar and then into the flax seed meal. You can also use corn meal or breadcrumbs if you want to.